LAHORE (92 News) – Police have on Tuesday apprehended at least four facilitators of yesterday’s massive suicide blast in a vegetable market in the provincial capital which left 26 people including police personnel dead and dozens others injured. According to a news report published in the 92 News, the terrorists changed three houses in the last couple of days. 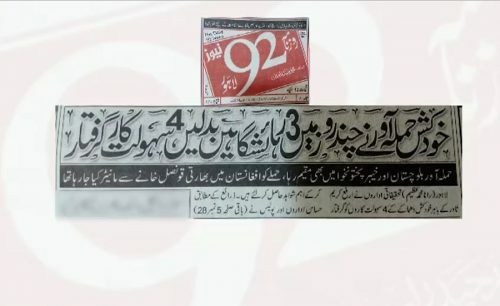 The news report stated that the terrorists also stayed in Balochistan and Khyber Pakhtunkhwa. The report further said that the terrorists attack was being monitored from Indian consulate in Afghanistan. Earlier, a suicide bomber had killed at least 26 people, many of them police, in Lahore on Monday, an attack which shattered a period of relative calm in Pakistan’s second-largest city. The powerful explosion hit a bustling main road in the south of Lahore on Monday and blew out windows in nearby buildings. He said the explosion killed at least 26 and injured 54 others, many of them police officers. 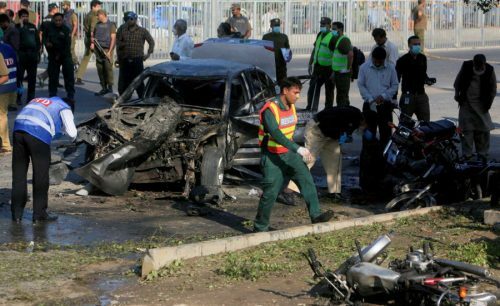 The Taliban claimed responsibility for the attack which wrought carnage near the Lahore Technology Park in the center of the city. Police deployed to clear street vendors from the area had been targeted, a police official said.